The recent debate in the Republican Party over the gold standard has kindled interest in whether or not re-introducing gold-backed currencies would be a good idea. It is advisable to begin with a word of caution. Although it is commonly talked about “THE Gold Standard”, there is no such thing as one particular gold standard. The gold standard of the late 1800s differs greatly from the Bretton Woods system. While in the former, currencies were indeed backed by gold, in the latter only the US dollar was. Other important currencies were in turn pegged to the US dollar so as to create a quasi-gold standard. The interwar period gold standard was yet another gold standard. As opposed to the United States now, Britain had been maintaining a current account surplus for the better part of the 19th century. The gold standard depended on Britain to reinvest its surplus abroad, not amassing it in gold at home. With the United States being as they are, a gold standard is destined to fail. Although Krugman argues that the gold standard was not a period of stability, even less so than “under the dangerous inflationist Ben Bernanke”, the 19th century was relatively prosperous. While proponents of a gold standard seem to think that it was the gold-based monetary system that led to this unprecedented calm period after the end of the Franco-Prussian war in 1871 until the outburst of the First World War, this is not exactly true. The prevailing opinion amongst contemporary economic historians is that not the gold standard led to the peaceful and prospering era between 1871 and 1914 but the other way around. It was the exceptionally placid period of the late 19th century which saw an enormous increase in world trade that allowed the gold standard to work. The functioning of a gold standard cannot be regarded as granted. Beginning in the 1890s, the gold standard experienced increasing difficulties. Global gold shortages put deflationary strains on the gold standard countries. This was helped by the fact that the pound sterling was increasingly being used as money, a money whose stability was unquestioned and consequently was never believed to devalue. Again, a considerable difference to the US dollar. From the graph below, which shows the historic prices of gold and the price of gold deflated by the CPI (All Urban Consumers: All Items), it can be seen how volatile not only the price but also the purchasing power of gold really were over time. 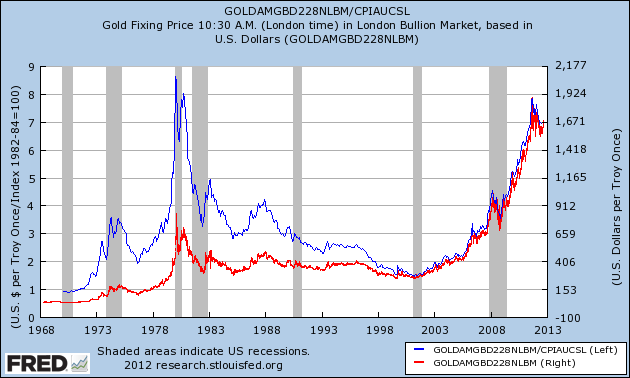 The chart clearly displays that gold is, like everything else, subject to the simple law of supply and demand. Arguably, gold is even more susceptible to booms and busts because there is so little inherent value relative to the value it is being given in times of uncertainty.